The Gaza emergency enters its fourth week amidst a severe deterioration in the humanitarian situation. Last night witnessed one of the heaviest Israeli bombardments so far, resulting in dozen of additional civilian fatalities along with widespread destruction of civilian property. An external wall of Shifa, the largest hospital in the Gaza Strip, was hit and damaged, and another UNRWA staff member was killed, mounting to five UNRWA staff killed so far. residential buildings, resulting in dozens of civilian casualties. Gaza’s sole power plant shut down after being hit and damaged: the additional reduction in electricity supply is expected to have a pervasive impact on the availability of food and access of people to basic services. Israeli imposed three kilometer wide ‘buffer zone’, to evacuate the area, except for three localities, ahead of further attacks. The number of IDPs exceeds 240,000; UNRWA has exhausted its absorption capacity in Gaza City and northern Gaza, while overcrowding at its shelters raises concerns about the outbreak of epidemics. Of particular concern is the damage sustained by the Gaza Power Plant (GPP), which brought the operation of the plant to a halt. Consequently, Gaza city is receiving electricity for about two hours a day, while localities in the Middle Area have no supply at all. This is expected to have a pervasive impact on the living conditions for several months, including in the functioning of water, sanitation and health facilities, as well as in food production , including the functioning of flour mills and bakeries. In the last 24 hours, the Israeli military also warned the majority of those who have remained within the three kilometer-wide ‘buffer zone’, to move westwards, ahead of further attacks, with the exception of residents of eastern Jabaliya, Al-Maghazi and Al Bureij camps, and Bani Suheila village. As a result, the number of internally displaced persons (IDP) has increased to over 240,000. This has exacerbated overcrowding at UNRWA schools and raised concerns about the outbreak of epidemics. 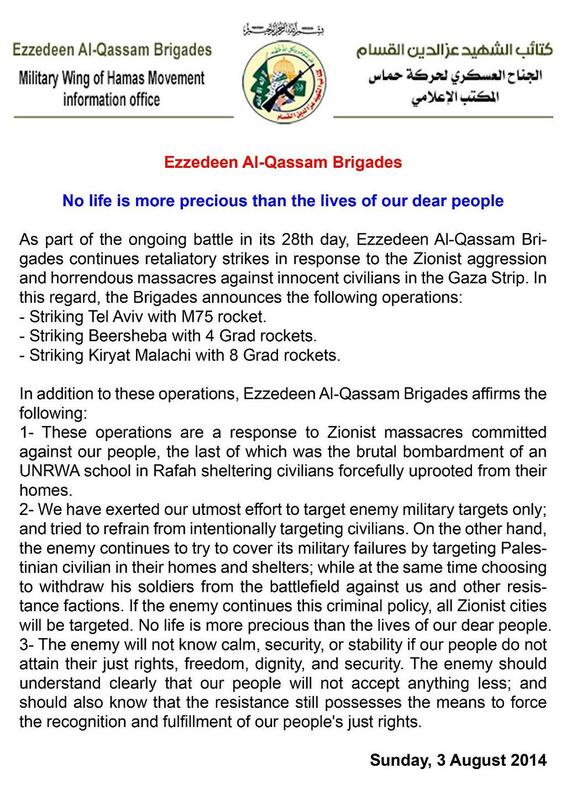 The Secretary-General has learned with concern that leaflets are reportedly being dropped by the Israeli Defence Forces in the northern Gaza Strip… this would have a further devastating humanitarian impact on the beleaguered civilians of those areas of the Gaza strip, who have already undergone immense suffering in recent days. The United Nations agencies present in Gaza do not have the resources on the ground to cope with, or provide assistance to, an enormous extra influx of desperate people. Since the last situation update, at least 51 persons have been killed or died of injuries they sustained previously,including at least nine children and 13 women. According to media reports, however, the number of deaths during the overnight bombings is larger and may include as many as 36 additional fatalities, whose bodies are still buried under the rubble or who could not yet be identified. Overnight, the town of Rafah, in the south, was subject to the most intense shelling since the start of the emergency, killing nearly half of the people that fall within the reporting period (23); at least eight residential buildings were targeted and destroyed and three severely damaged, resulting in most of these casualties. Heavy tank shelling and fighting were recorded also in Al Bureij camp in the middle area. According to initial reports, in one of the incidents, involving the targeting of a residential building in the camp, 16 members of the Abu Jabber extended family, were reportedly killed, including five children: Muhamad, three years old, Lina, two years old, and Jihad, Toga, and Jamal, all one year old. The house of Al Bureij’s mayor has been also targeted, killing him, his father (76) and his nine year old nephew, from the Abu Shamaleh family. Since the launch of the Israeli military operation, hundreds of homes have reportedly been directly targeted by Israeli airstrikes, and it is estimated that approximately 750 targeted residential structures (including multi-storey buildings) have been totally destroyed or severely damaged, causing hundreds of civilian casualties , including multiple members of the same families. UN High Commssioner for Human Rights, Navi Pillay at the Human Rights Council 21st Special Session, 23 July 2014. From 7 July to 14.00 today , according to preliminary data collected by the Protection Cluster from various sources, Israeli air, naval and ground strikes in Gaza have killed at least 1,118 Palestinians. This includes at least 827 civilians (74per cent of total fatalities); including 243 children and 131 women, 180 members of armed groups and 110 persons whose status is yet unknown.During the reporting period, nine Israeli soldiers have been killed in Israel, next to the fence with Gaza, bringing to 53 the number of Israeli military fatalities since the beginning of the ground offensive on 17 July; this is over five times higher than the number of soldiers kill ed in the “Cast Lead” offensive in 2008/9. Indiscriminate firing by Palestinian armed groups in Gaza into southern and central Israel continued, with most falling in open areas or intercepted by the Iron Dome system, resulting in no additional civilian fatalities during the reporting period.Since 8 July, three civilians in Israel have been killed, including one foreign national, and a few dozen directly injured by rockets or shrapnel. as of this afternoon were hosting 200,400 IDPs. That is over 11 per cent of the total Gazan population and nearly four times more than those sheltered by UNRWA at the peak of the three-week long Israeli Operation “Cast Lead” in 2008/09. An average of nearly 2,400 IDPs are taking refuge in each of the 85 UNRWA schools, which normally have the capacity to accommodate only 500 people, and have not been designed as living spaces. Shelters are under great pressure, without adequate water sanitation and hygiene (WASH) infrastructure in place, raising concern about the outbreak of epidemics. who have fled the conflict are staying with host families, but it is estimated that this number ranges in the tens of thousands. A fuel tank supplying the Gaza Power Plant (GPP) was hit and damaged, shutting down operations. According to the Palestinian Energy Authority, repairs could take months to complete. This is the third attack affecting the GPP since the start of the emergency. Additionally, despite some repairs, the previously damaged ten feeder lines from Israel remained down. Therefore Gaza currently receives just 64 megawats of electricity from Egypt and Israel, less than 18 per cent of the estimated demand. Protection of civilians: ensuring respect for the IHL principles of distinction, proportionality and precaution in attack. and meaningful humanitarian pauses or corridors for the evacuation of the injured. This is needed among other reasons, to complete search and rescue operations in several areas, and repair critical water and electricity infrastructure. Erez: On 29 July, the crossing was open during a limited time only for specific and pre-coordinated movement only. Beit Hanoun (Arba-Arba): Closed until further notice but still accessible. Rafah: Open today from 9:00 to 15:00. A total of 12 injured Palestinians exited Gaza through this crossing. 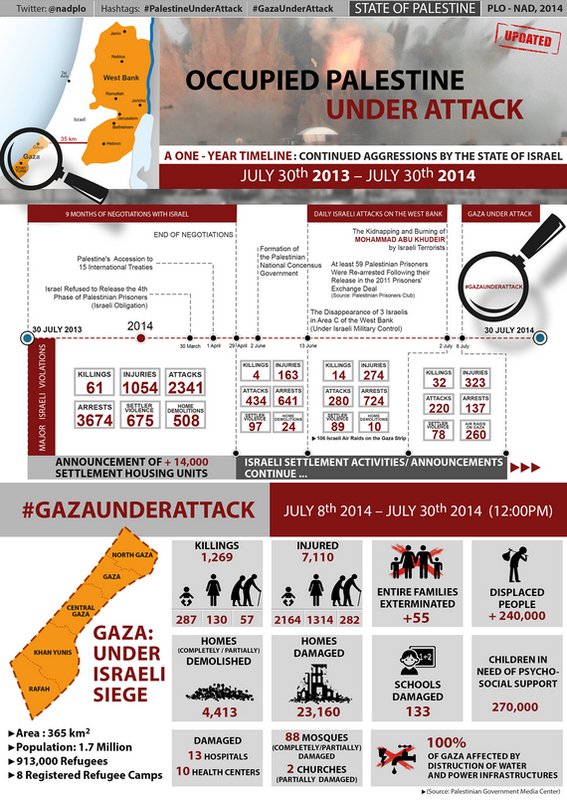 On 28 July, five truckloads of food supplies entered via Rafah. Read the details of the report (pdf) here.